Preheat oven to 375 degrees. Put bacon in a cold pan over medium-high heat, flipping three-quarters of the way through cooking, until crisp, about 10 minutes. Transfer the bacon to a paper towel-lined plate and reserve the fat. Grease a 12-cup muffin tin with some of the reserved fat and set aside. In a big bowl, whisk together the cornmeal, flour, sugar, baking powder, baking soda, and a pinch of salt. In a medium bowl, whisk the eggs, buttermilk, and 2 tablespoons of the reserved bacon fat to a uniform color. Chop 10 slices of the bacon coarsely into roughly 1/4-inch pieces. Finely chop the remaining 2 slices and set aside. Quickly, but gently, fold the liquid mixture into the dry mixture. (It should be a loose batter, not a dough. If not, add just a tad more buttermilk.) Fold in the coarsely chopped bacon. Divide the batter among the muffin cups in the prepared tin and bake until the tops are golden and a toothpick inserted in the center comes out somewhat clean, about 15 to 18 minutes. Let cool 7 minutes, then turn them out upside-down so they develop a nice thin crust on the baked edge. Cool to just warm or room temperature before frosting, another 7 to 10 minutes. With a hand mixer or in the bowl of a stand mixer with a paddle attachment, beat the honey, butter, and a pinch of salt together until light and fluffy. Transfer to a pastry bag fitted with a large closed-star tip and pipe a generous tablespoon on the tops of each of the cupcakes. Sprinkle finely-chopped bacon on top and serve. Summer's coming, and the heat reminds me of camping. But if you're like me, you can't get out much. You're confined to your home! You can't build a fire! You wanna make some s'mores, but you gotta film this new thing! Ok, maybe that last one was for me. But we've all been there: a hankerin' for s'mores and no way to enjoy them. Until now! For the pudding, combine 1½ cups milk, sugar and cocoa in a nonreactive saucepan over medium-high heat. Bring to a simmer, then remove from heat. Meanwhile, whisk the remaining 1/2 cup milk, cornstarch, salt, egg yolks and vanilla in a bowl. Gradually whisk hot milk into egg mixture, then return to the saucepan and cook over medium-high heat, whisking constantly, until pudding comes to a full boil. Reduce heat to maintain a simmer, and continue whisking until thick, 2 or 3 minutes more. Pour into a plastic container. Cover with plastic wrap and refrigerate until set, at least 4 hours or ideally overnight. For the graham crackers, combine both flours, sugar, salt, cinnamon and baking powder in a medium bowl. In a separate bowl, whisk egg with oil, honey, and 2 tablespoons milk. Stir egg mixture into dry ingredients for a stiff dough, adding more milk, if necessary. Wrap dough and chill until firm, about 1 hour. Preheat oven to 300°F. Divide dough in half, and working 1 piece at a time, knead dough gently until it holds. Roll out dough to 1/16-inch-thick on parchment paper. Transfer on parchment to a baking sheet; repeat with second piece of dough. Brush dough with milk, then sprinkle with cinnamon-sugar, if desired. Bake for 10 minutes, rotating pans halfway through. Remove from oven, and use a pizza wheel or sharp knife to cut into 3-by-2-inch rectangles, without separating. To assemble, in a 12-ounce mason jar, pipe a layer of chocolate pudding, then sprinkle a layer of slightly crunched up graham crackers. Next pipe a layer of marshmallow cream and brown the top with a blowtorch. Pipe another layer of pudding, add another layer of graham crackers, and another layer of marshmallow. Brown the top layer of marshmallow and screw the lid on. Don't make too far ahead of time or the graham crackers will get soggy. Combine the sanding sugar and cinnamon in a large shallow dish or pan that's large enough to roll the churros in (at least 8-inches wide). Set aside. Set up a baking sheet lined with a bunch of paper towels for the finished churros. Transfer the mixture to a stand mixer fitted with a paddle attachment. With the mixer running on low, add the eggs one at a time. Mix until the eggs are well incorporated. Fill a Dutch oven or pan with 2-2 1/2 inches of oil and place it over high heat. You want the oil to be at 345 to 365 degrees F during the frying process; use a thermometer to monitor the process closely. When the oil hits 340 degrees F, turn the heat down to medium and try to maintain the temperature range. Fit a pastry bag with a large closed-star tip and fill it 3/4 full with the churro dough. Squeeze the dough directly into the oil in 4 inch lengths, using scissors or a paring knife to separate the dough from the bag. You can fry 4 - 5 churros at a time, use metal tongs to keep them separated in the pan, about 2 minutes on each side until the churros are deep golden all over. Gently remove the finished churros with tongs and place them directly into the cinnamon-sugar mixture, rolling to coat them evenly. Place them on the paper towel lined sheet tray. Repeat until you've used all the dough. Poke a hole in the end of each churro with the tip of a paring knife. Fill a pastry bag fitted with a large (3/16-inch, #801) round tip with the Rompope Pastry Cream. Take each churro, insert the pastry tip in the end and fill. Repeat until all churros are filled. Serve warm. Combine the milk, almonds and granulated sugar in a blender and puree until smooth. Transfer to a pot, add the cinnamon stick and bring the mixture just to a boil over medium heat, scalding it. Meanwhile, whisk together the egg yolks, cornstarch and a pinch of salt in a bowl. Slowly whisk in the scalded milk mixture, then return the mixture back to the pot over medium heat. Cook, whisking constantly, until thick and you can see the trails of your whisk, about 2 minutes. Remove from the heat and whisk in the butter, then the rum. Cover the surface with plastic wrap to prevent a skin from forming and refrigerate until ready to use. I'm working on some stuff right now for an event I have this weekend. I can't say what it is just yet, but it did remind me of the eclair challenge on season three of Kids Baking Championship. You know, I would never give those kids a challenge dish I wasn't comfortable making myself. So here's my take on this French staple. For the choux pastry: Preheat the oven to 375 degrees F. In a large saucepot over medium-high heat, bring the butter, salt and water to a boil. Using a wooden spoon, add the flour in thirds, stirring it in as fast as possible. Smash any lumps against the side of the pot. Cook the mixture until the dough forms a ball that pulls away from the sides of the pot, about 2 minutes. Add the dough to the bowl of a stand mixer and let it sit and cool for 5 minutes. Beat on low for 1 minute to release steam. Add the eggs, one at a time, until the dough is smooth and pipeable yet still holds its shape. Add the dough to a pastry bag fitted with a large tip. Place 4 tiny dabs of dough in the corners of a large baking sheet, then tack down a piece of parchment on top. Pipe the dough into 5-inch lines about 2 inches apart from each other on the prepared baking sheet. Bake, rotating once halfway through, until deep golden brown and dry in the centers, 20 to 25 minutes. Let cool. For the whipped cream: In a stand mixer fitted with a paddle attachment, beat the cream cheese with the sugar and vanilla seeds until smooth. Add the heavy cream and continue to beat until medium peaks form. Transfer to a pastry bag fitted with a medium round tip. For the chocolate glaze: Meanwhile, melt the chocolate over a double boiler. Remove from the heat and stir in the butter until completely melted. Whisk together the corn syrup and cocoa powder in a small bowl, then whisk into the chocolate mixture. Set aside until ready to use, but don't refrigerate. For the poured fondant glaze: Combine the confectioners' sugar, corn syrup and water in a bowl set over a double boiler. Heat, whisking, until smooth and uniform. Turn the heat off and let sit over the water bath until ready to use. Whisk again right before using. Insert the tip of the pastry bag with the whipped cream into the ends or bottoms of the eclairs to fill them. Dip filled eclairs into the glazes and place on a rack to set. This is my great-grandmother Mamo's apple strudel recipe. It's amazing. When I was taught this by my grandmother, she said "Listen, you don't tell anyone that doesn't have your last name this recipe." We kept the recipe locked away in hopes of selling out to a major corporation. Well, that ship has sailed. Also, why should a major corporation make this in mass quantities? You should make it! At home, with family, the way it was meant to be made. What was Mamo's secret? Canned pineapple! Your strudel won't taste like pineapple. It amps up the apple flavor. Trust me. Well, not me. Trust Mamo. Place the apples into a large pot on the stove over medium-high heat. Add the pineapple, sugar, 1 cup water and salt. Cook until the moisture evaporates and consistency of the remaining fruit is thicker than preserves, 30 to 35 minutes. Stir often to prevent burning on the bottom. Cool, then stir in nuts. In a pot, melt the butter over very low heat. A white foam will form as the top layer. Skim off the foam with a spoon. Once the foam is removed, add the oil. Stir and remove from the heat. On a sheet of waxed paper, lay out the first layer of phyllo dough. (Dough dries out quickly, so keep other layers not in use covered with a damp cloth over a sheet of waxed paper.) Using a pastry brush, gently brush the butter/oil mixture onto the entire sheet of dough. Sprinkle with the breadcrumb mixture over the entire surface. Repeat for an additional 4 layers so each roll has a total of 5 layers of phyllo dough. Using a spoon, add a row of the apple filling an inch or two from the bottom of the dough. Do not overstuff or the strudel will burst when baking. Lift the bottom edge of the waxed paper with both hands, each about a third of the way in from the outer edges to support the phyllo as you roll up the dough, jellyroll style. As you roll, fold the sides inwards to form sealed edges as you continue to the end. End with the seam-side down. Coat a baking pan with the butter/oil mixture and place the first rolled dough onto the pan with the seam facing down. Then brush the roll all over with the butter/oil mixture. Bake until golden brown, 40 to 45 minutes, depending on your oven. During baking, baste 4 to 5 times with the butter/oil mixture. Coffee is to chocolate as salt is to beef. You're not making a coffee-flavored cake. It just makes the chocolate POP. If you've never tried adding coffee to your chocolate cake recipe, take this recipe out for a spin. Preheat the oven to 350˚F and grease and flour two 9-inch round cake pans. In a big bowl, mix the flour, sugar, baking soda, and salt. In a medium saucepan over medium heat, melt the butter. Whisk in the coffee, cocoa powder, and ½ cup water and heat it for a minute, stirring constantly. Pour the melted butter mixture into the flour mixture and whisk until well combined. In a medium bowl, whisk the eggs, buttermilk, and vanilla. Add it to the batter and mix until smooth. Divide the batter between the two cake pans, scraping all the batter from the bowl with a rubber spatula. Bake for about 40 minutes, or until a toothpick inserted into the center comes out clean. Let cool for 15 minutes in the pans and then turn out onto a wire rack to cool completely. Frost with the frosting of your choice... like that Swiss Buttercream! Easily the entire bakery’s favorite cake. You probably have some fond memories of a super good, super moist carrot cake growing up, too, right? Have you tried replicating it, but it's just not as moist and delicious as you remember? Chances are your carrot cake recipe is only calling for butter. It's not gonna be that good. Same thing with chocolate cake. So what do you do? Oil. Lots of oil. That's gonna help get your cake where it needs to be. Another thing to keep an eye on is that batter. You want it to be really shiny. 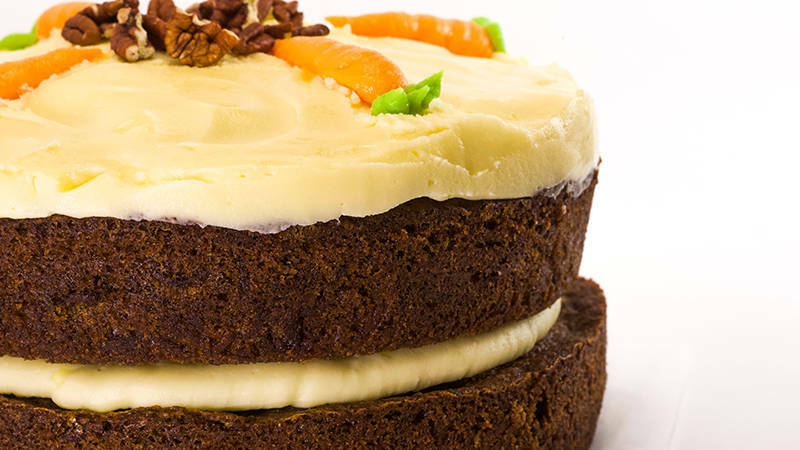 Luckily, you've got your pal Duff here with a wicked carrot cake recipe to impress. For the cake, preheat the oven to 350˚F. Grease and flour two 9-inch round cake pans. With a hand or stand mixer, mix the eggs and oil. Add the sugars and mix well. In a medium bowl, mix the rest of the cake ingredients except the carrots (and raisins and nuts, if using). Add the flour mixture to the sugar mixture and mix well. Add the carrots (and raisins and nuts, if desired) and mix until incorporated. Divide the batter evenly between the pans, scraping all the batter from the bowl with a rubber spatula. Bake for 35-40 minutes, or until a toothpick inserted into the center comes out clean. Let cool in the pans for 15 minutes, then turn out onto a wire rack to cool completely. Spread the frosting over each cooled cake layer, then assemble the carrot cake. My first job was at McDonald's, believe it or not. I was good! I could make twelve Big Macs in a minute, no joke. One of my favorite things on the menu was their apple pie. You know what I'm talking about... that delicious flaky crust with the molten hot lava goo filling you'd always burn your tongue on? You won't find another apple pie quite like McDonald's. Problem is, I love reverse-engineering things that you can buy and instead make them at home. This is my take on McDonald's super tasty dessert offering. Whisk together salt, sugar and flour. With your fingers, tear off pieces of the butter and toss them in the flour. Massage the butter into the flour until you have nice big chunks of buttery flour in what looks like sand. Add half the water, stir in with a wooden spoon. Gently! Add the rest of the ice water and the vinegar and fold with a wooden spoon until the dough forms. Wrap in plastic wrap and rest in the fridge. Overnight if you can! With the paddle attachment on a stand mixer or with an electric egg beater, cream together butter, sugar, salt, vanilla, cinnamon. Add the flour and mix until the streusel looks like chunky wet sand (kinda). If the streusel becomes a dough, add flour until it becomes wet sand. Store in the fridge, wrapped, for like a week tops or in the freezer indefinitely. Peel the apples. Do not put them in water for crying out loud! Cut the apples into slices. Not too thin. Like one centimeter on the obtuse end. Toss the slices in the sugar and the cinnamon. Melt the butter on the stove in a large sauté pan. If you don't have a big sauté pan, do the apples in batches. Fry the apples in the butter nice and hot and get some color on them. Set the apples aside in to cool at room temp. In a deep saucepot, bring the cider or apple juice to a fast simmer. Reserve 1/2 cup of cider. In a bowl, whisk together the cornstarch, sugar, salt, cardamom, nutmeg, cloves, and cinnamon. Whisk the reserved cider into the dry ingredients and create a thin paste. If the paste is too thick, add water a few drops at a time until it loosens up. Slowly drizzle the the paste into the simmering cider while whisking the cider with a firm hand. When the goo thickens and becomes translucent again, turn off the heat and add 1/2 stick of butter to it, set aside to cool. Line the pie pan with dough and decorate as you see fit. Do your best! You're putting a lot of effort into this pie. Make it beautiful, too. Toss the apples and the goo together in whatever ratio you want. You don't have to use all the goo. It's delicious on ice cream. Fill the pie about 4/5 full. Fill the rest of the pie with streusel. Use a lot of streusel. It's delicious, too. Bake at 375 in the middle rack until the top gets light golden brown. 20-30 minutes. Then place an empty sheet tray on the top rack and bake for 15 more minutes. If the top starts getting too brown, pull it out and wrap the top in aluminum foil. Put the egg whites in the bowl of a stand mixer fitted with a whisk attachment. Start the machine on medium-slow speed and whip until the eggs begin to get frothy. Turn the speed to medium. Slowly add the sugar to the whipping egg whites, dropping the lemon juice in about halfway through the process. When all the sugar is in, speed up the mixer and whip until stiff peaks form and the meringue is smooth and super shiny. Turn the speed to medium-low and begin adding the butter. Add it bit by bit so the meringue doesn’t slop over the sides of the bowl. At this point, the meringue will fall and look ruined and broken. It’s not. This is what happens and it’s okay. If the meringue doesn’t fall, add a little extra butter until it does. Turn the speed back up to medium-high and walk away. Come back in 10 minutes. Does it look like buttercream? No? Walk away and repeat until it does. If it still doesn’t look like buttercream after 30 minutes, add more butter until it does. Use immediately, or cover and refrigerate for up to 1 week. Warm and rewhip the buttercream before using it if refrigerated. This is the official Charm City Cakes buttercream. It’s based on Swiss meringue and provides the correct consistency for icing cakes and decorating. Swiss buttercream is sturdier than a cold French meringue buttercream and much easier to make that a hot Italian meringue buttercream. It’s super versatile and can be flavored and colored however you want it. You can also airbrush it, but lightly, as the high fat content will resist any substantial amount of liquid. You can store it at room temperature for 24 hours; more than that and you need to keep it in the fridge. If you’re not using it directly after making it, you always want to rewhip it right before use by beating it in the mixer with the whisk attachment and adding a bit of heat from a kitchen torch until it looks right. If you’re planning on using buttercream that has been kept cold, pull it out of the fridge about 2 hours before you intend to use it, whip and heat it, and then you’re ready to go. Sometimes you’ll see people dip a spatula into hot water before icing a cake. This is wrong. If you heat the buttercream to the correct workable temperature, you won’t need a warm, wet spatula. Swiss buttercream keeps for about a week in the fridge, but it’s always good to just make what you need when using egg product.